This is a very nice medium power eyepiece set. 1.25- inch 4mm plossl eyepiece set , gives the widest viewing field along with extra sharpness and long eye relief. 4-element plossl design, has a approx 52- degree AFOV. Perfect for broad-field lunar observations, medium-sized star clusters, and a wide range of cloudy nebulas and deep-sky targets. Comes with sturdy plastic case-proect the eyepiece from dust and moisture. Soft rubber eye guard that's custom fitted with a bayonet mount. Threaded for standard 1.25- inch astronomy filters and barlow lens. Threaded for standard 1.25- inch astronomy filters and barlow lens. 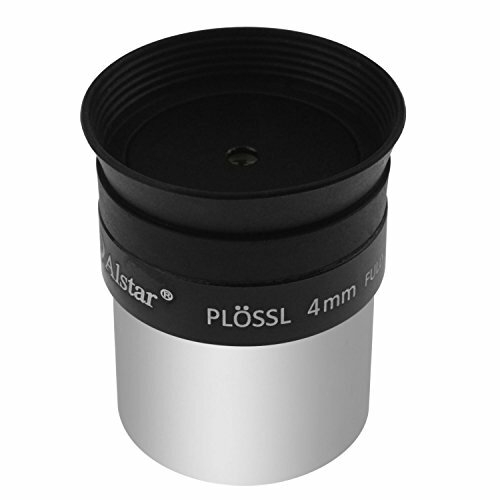 1.25- inch 4mm plossl eyepiece set , gives the widest viewing field along with extra sharpness and long eye relief. 4-element plossl design, has a approx 52 degree AFOV. Perfect for broad-field lunar observations, medium-sized star clusters, and a wide range of cloudy nebulas and deep-sky targets. Fold-down rubber eyeguard Threaded for standard 1.25- inch astronomy filters.